If this work seems daunting on the scale of a whole community, break it down to a manageable size. Imagine a small community. A tiny one. Imagine making programming for a tiny island of just one person’s assets, needs, and interests. That’s the kind of art Odyssey Works makes. Odyssey Works is a group of artists, led by Abraham Burickson, who make immersive art experiences for one person at a time. That’s right: one. For each project, Abraham and his colleagues find funding and invite prospective audience members to apply. They select their audience member and spend months getting to know that person. They spend time with them. They call references. They try to understand not just the surface of the individual’s personality but the fundamental way that person sees the world, what Abraham calls their “experiencing consciousness.” And then, based on their research, they remake the world for a weekend, twisting the person’s environment with sensory experiences that explore and challenge their deepest inclinations. Instead of starting with a script, this artwork starts with the audience. The audience provides an artistic challenge, a challenge like any other creative constraint. Odyssey Works starts constrained by the audience member’s perspective. The audience provides an offering of their idiosyncratic way of looking at the world. They expose the keys within their hearts. The artists spend time in the rooms that matter most to the audience. They locate those familiar, favored rooms, learn what makes them meaningful, and then they start sketching new doorways out of those rooms into unexpected places. They did that for Kristina. Kristina’s Odyssey Works weekend started with something she loved: Clair de Lune by Claude Debussy. Kristina loved all things symmetrical and tonal. Throughout the day, she encountered those perfect piano notes again and again. In a classical architectural space. With her family. Each time, the music was a treat that reinforced her worldview. Kristina started to relax. The artists who were creating this weekend for her clearly understood her world, her preferences. They weren’t judging her. They understood her. She was in a space of comfort. And so she started to let down her guard, to trust, to open up. As Kristina’s reservations and judgments faded, the song started to shift. She started hearing different versions of Clair de Lune. Weird ones. Discordant ones. Seven hours and 500 miles into her weekend, she got picked up at a train station by a car. During the drive that followed, she listened to a version composed just for her: an 80-minute deconstruction of the 4-minute piece. The music was a slow deterioration. It started classical and ended sounding like people chewing on string. It was beautiful noise. It was the exact opposite of what Kristina liked, and yet by that point, she found it beautiful. Kristina’s whole experience was kind of a deconstruction of form. An unwinding of the structure that rooted her life. It went from something familiar, at the heart of what she already knew, and took her somewhere wild and unexpected. The journey made that foreign destination relevant to her for the first time. The experience was powerful for her. She said it pried her open. After the Odyssey Works experience, Kristina changed her life. She quit her job, broke up with her boyfriend, moved to a new town. That wasn’t Odyssey Works’ goal. The goal was not that Kristina should change her life or enjoy discordant music. Nor was it about creating a moment of pleasure. The goal was to create work that was both genuinely moving for her and a compelling artistic challenge for Odyssey Works. It was a love letter from someone she’d never met. It opened a door to a new level of engagement with life. It made new things relevant. At its core, Odyssey Works’ approach is about empathy and trust. They start by learning about and valuing their audience in a serious way. Too often, when we talk about “starting from the audience,” we stay at the surface. The results are superficial connections. These people like hip hop so give them hip hop. Those people like cats so give them cats. Some people show up, they seem happy, we call it a day. Odyssey Works goes deeper. They start at the front door, and then they pick their way through the minefield of self-presentation—the surface-level selves that we show in public every day. They gain access to the precious, vulnerable dreams we guard behind walls of personality and self-presentation. They make people feel safe in their precious rooms. And then, they invite people to open up. They fling new doors open, going to wilder and further places beyond the audience’s own experience. As guides, they reduce the effort required to make the journey. 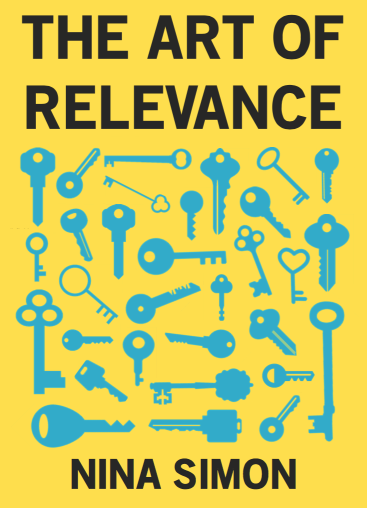 Remember, relevance isn’t about what’s familiar or what we already like. It’s about going somewhere that brings new meaning, new positive cognitive effect, to our lived experience. That’s what Odyssey Works provides.